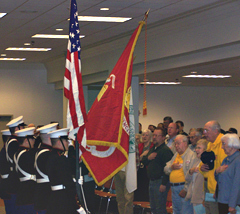 Veterans say the pledge of allegiance. Veterans Day celebrations across the state today included the annual event at Veterans Memorial Auditorium in Des Moines. There was the traditional service music honoring veterans and Pat Palmershiem, the executive director of the Iowa Department of Veterans Affairs spoke about the sacrifice given by those who serve. Palmershiem says the price paid by veterans is real, as real as a life lost, a horror endured or a body torn and disabled. Palmershiem says veterans continuing paying the price long after the war ends. Palmershiem says well over half of all the veterans who have taken up arms for our country live among us today. He says the 25-million veterans from World War One to Iraqi Freedom paid a personal price for the freedom and security we all enjoy. Corson says he so often hears that the modern generation is “the lamest bunch of slackers anyone has every seen. That all they want to do is to play their video games. That they are not studious and don’t study, and that they have the attention span of a tree frog.” Corson who is also a college professor, says that’s not what he’s seen when he talks to recruits. 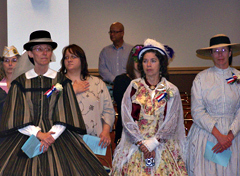 Women dressed in Civil War era clothing for Veterans Day event. Corson says the current military is strong because of the veterans of the past. “The lineage that we trace back throughout our history, certainly to the Greatest Generation if not beyond. That lineage is the inspiration for this generation of our service members,” Corson says. 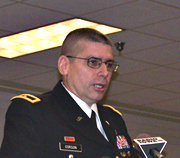 Brigadier General Corson commands 300 soldiers in Iowa and has six-thousand additional soldiers in 100 units in Minnesota, South Dakota, Kansas and Missouri under his command.